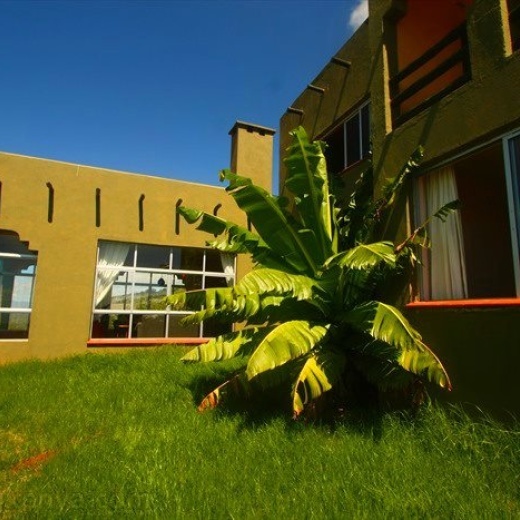 Masaai House is a self catering house situated at the Green Park Naivasha. It is a two storey family house with a large suspended timber deck facing the park, ideal for sundowners and barbeques. The best place for a holiday gate-away. The lovely house can accommodate up to 8 people, with large windows to enjoy the views all over the house, of the park and enjoy the stars at night even in the bedrooms and the deck's view is just stunning. Security is provided by Green Park Club. You can dine and use bar facilities at Great Rift Valley Lodge. We had a really good stay. The location was a bit further than we had expected and there was a bit of problems with the flow of water but overall we really enjoyed the place and the host was really nice. The main problem was the location. From the website it shows that the location is on the lake, near Fisherman's. However the house is actually way up in the hills near Great Rift Valley Lodge, which luckily worked for us but was very different than what we were thinking. The location however was very nice but very hard to get to and required a 4x4 which was also not listed on the website. The house was very dirty when we arrived, especially the outdoor patios and the caretaker didn't seem to be aware that we were coming. There was no toilet paper in the house when we arrived and as stated, the house was very dirty. Our stay was okay. Only concern we had was that the water was not hot and we had to provide our own tissues. It was awesome. We had a great experience. It was a bit of a hassle getting to the place but we called the owner and she was extremely helpful. We loved the house. Masai House is a nice place. The environment is quite tranquil and the house is nice however there were a few things that could be improved on. For instance when we got there, there was no gas even though someone did quickly go to fetch it. The main problem was that it had not been cleaned for quite a while. Lots of leaves on the balcony, it was dusty inside and the kitchen was not well kept. Perhaps just a quick cleaning before guests arrive would have been nice. It was really nice. The service was excellent. It was my second time there and they were both equally nice stays. I was with friends an loved the experience. The service was great. The whole idea is to get out of town and it's quite remote which we loved. The staff was not in a hurry to chase us out which was nice after a long night of partying! It went well. The only thing is that the caretaker was absent. Jane was really helpful though. The cleaning lady was great and the accommodation was good quality. A sign showing directions to the house from the road would have been helpful. Louisa the host was however able to give us good directions. It was great. Thanks! It was perfect. Best place to go as a family. Wife loved it. Family loved it. The caretaker was very helpful. She went over and above what was expected. The guards went to fetch us firewood. The place is actually better than in the photos. More than what we expected. We almost wanted to do an extra night but there was another group coming in. A little hard to find so make sure to call the caretaker. Once you pass the runway, it's best to get directions again. We were really just so pleasantly surprised. The location was further than expected and this should be explained in the accommodation description (that it is half an hour from Great Rift Valley Lodge which is itself half an hour away from Naivasha town). The guards at the Lodge kept requesting for receipts when leaving and entering even if we explained that we weren't staying at the Lodge. Otherwise the house was great, the view was awesome and the caretaker pleasant. We thought it was far and into the bush, but on arriving there Mbugua the caretaker was still waiting for us, we loved the house, and the sunrise view was spectacular..... it was awesome, we have to go back again.... soon. They need a new care taker. The one on site was NOT helpful at all. There was garbage in the dustbin in the loo from the previous occupants, the kitchen sink was leaking, the caretaker made us wait for him at the club while he was earning extra being a caddy. On the day we were departing the same bucket that we were using under the sink to collect dirty water is the same one that was used to wash the sheeets!!! I know, eiwwwwwwwwwwwwww.